The Hybrid UPS is an evolutionary UPS. Also,, it can be accurately described as Disruptive Technology because it has the potential to become the world wide standard for powering servers, radios and other devices where it is desired to have battery backup for those times of utility outages. Once the blue sketch is studied it becomes abundantly clear why the claim of Disruptive Technology appropriately describes the Hybrid UPS patent. This Patented Hybrid UPS provides battery backup power for any dual AC/DC server, radio or any device.having dual AC/DC input capability. It is 20% more efficient than any true UPS (double conversion) presently in the market place. It also provides superior reliability compared to any UPS presently in the market place. Its universal AC input voltage allows it be used anywhere in the world. Its superior efficiency makes it small and applicable for distributed power as well as bulk power. I have a demonstration system that is mobile and is equipped with metering devices to verify operational efficiency and reliability. It is easily rack mounted and includes batteries. It can be installed in the rack with servers and also has an option for servers that are AC powered only. The accompanying picture of the Hybrid UPS System shows the testing and demonstration system and how it is arranged with a meter panel at the top front for validating DC voltage and current and watt hours. Just below the meter panel is an actual Hybrid UPS. Just below the Hybrid UPS is a comparable double conversion true UPS. Below the comparable double conversion true UPS a dual input AC/DC server., At the bottom left of the picture is a meter system for validating AC voltage and current and both wattage and watt hours. All the equipment in the system is power by 120VAC input and converts to 48VDC. 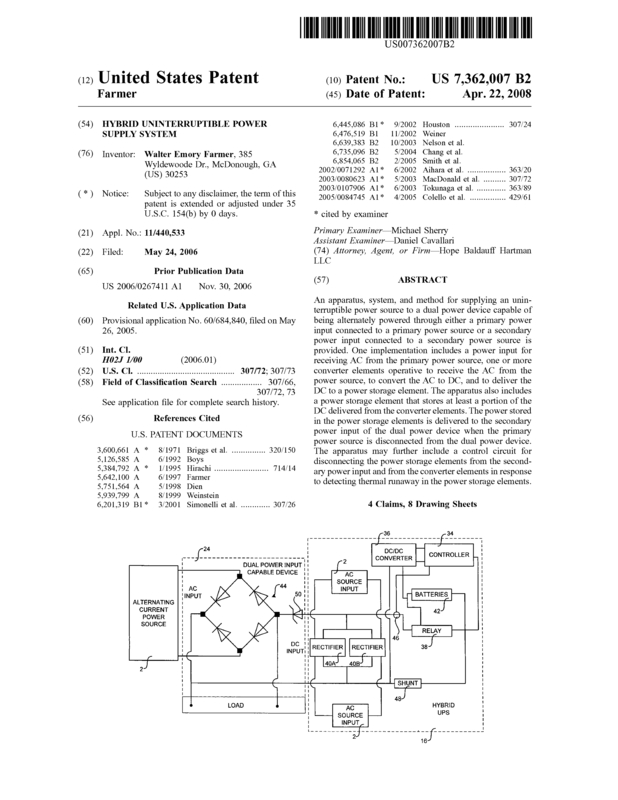 Page created at 2019-04-25 18:31:28, Patent Auction Time.